Back in November I wrote a blog on materialism at Christmas and how Kyle and I and his family had chosen to give our Christmas away by serving the Church in Thailand. Many people have commented on the sacrifice it must have been to “give our Christmas away”, spend our Christmas in another country, sweating instead of curling up by the fire with family 🙂 but I want to tell you about the gifts we received this Christmas. They weren’t physical, but they were by far the most meaningful gifts I have ever received. I was reminded this Christmas that we serve a good God who loves to give us good gifts! One of the things Kyle and I were looking forward to the most was reconnecting with our Thai friends we grew to know and love when we lived there 2 years ago. And what a gift it was to see our friends’ maturity with Jesus grow and their leadership and commitment to serve him even when it meant personal or family sacrifice. The first gift from God came the day we arrived. Our plane was delayed 4 hours in Chicago, causing us to miss our connecting flight in Tokyo. We were bummed that we would likely miss church Sunday morning due to this delay, but had come to accept that as we waited in Chicago. However, when we arrived in Tokyo, we learned that our flight into Bangkok Thailand would arrive at 5:30am Sunday morning! We could still make it to church to worship with our friends! After being picked up at the airport in Bangkok, tired from around 36 hours of travel and running on adrenaline and pure excitement, the missionary informed us that Kyle’s good friend, P Chin would be preaching his first sermon that morning! When we met P Chin over 2 years ago, he was a believer, but very rough around the edges. Before he knew Jesus, he was a murderer, drug dealer, and spirit channeler, and although he had experienced much healing and transformation in his life, he still liked to argue with authority, especially the pastor. Since we left, he had been growing in his leadership and softening his heart to authority, and about a month ago, he started Bible school to become a pastor. The Sunday we arrived was his first sermon and God blessed us greatly by being able to be there to hear it! Despite delays, we made it in time to hear P Chin’s first sermon! What a gift! Later in the week, I was reminiscing with our friend Knot about how much he had grown since we first met him over 2 years ago. He was not a believer back then and was consumed with making money. He had since committed to follow Christ, been baptized, shares the Gospel with anyone he meets, and leads a Bible study in his home. He told me that after we left, he had realized that he didn’t have enough time to serve God like he wanted to, so he quit his job so he could serve God better. I was floored by this comment. He said it so matter-of-factly, like it was the most logical thing to do if one doesn’t have time to serve. So many times, we use not having enough time to serve as an excuse not to. But this money-driven businessman had been transformed by the grace of Jesus and now works only part time so he can serve in the church. What a gift to see the seed that was planted years ago, growing, bearing fruit, and planting seeds of its own! Wonderful time reconnecting with good friends, Knot and Goi! Our family’s role in the Christmas outreaches was to help with kids games and activities, bake hundreds of cookies and Christmas goodies to share, and serve the missionaries in several other random ways. Between our team and the TREK team who serves there full time, we helped the churches host 10 outreach events in 9 days. Kyle and I had been a part of similar events while on TREK 2 years ago, but what a gift it was to serve with family – to see how each person’s gifts and passions combined to make a great team, to cover for one another when someone was sick, to learn from one another as we studied the Bible together, to see their passions come alive as they served, and even to serve outside our comfort zones and be stretched together! One of the ways the family was stretched was by being on stage! 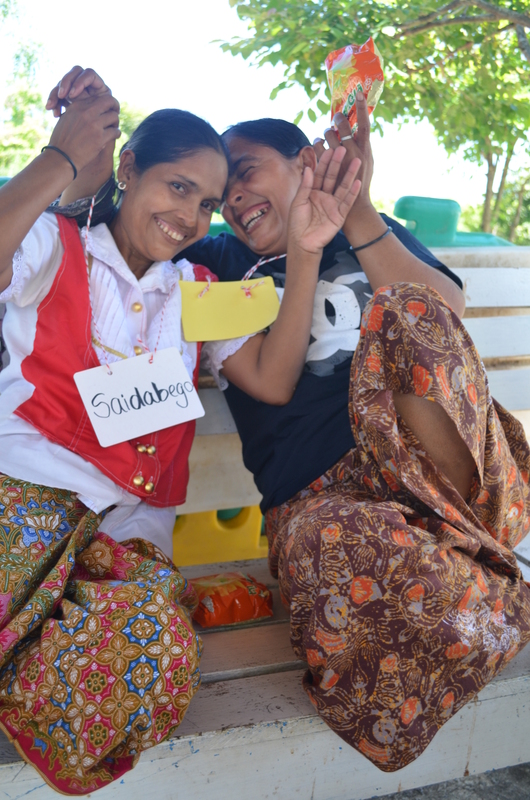 The Thai church received 200 Operation Christmas Child shoeboxes this year to give away at the outreaches. These shoeboxes are packed with hygiene items, toys, school supplies and other things to bless needly children. Our family has packed OCC boxes for years and this year we got to be a part of seeing the other side of OCC boxes. Even though there was not enough shoeboxes for every child at every outreach, there was always enough gifts for every child to receive something for Christmas. 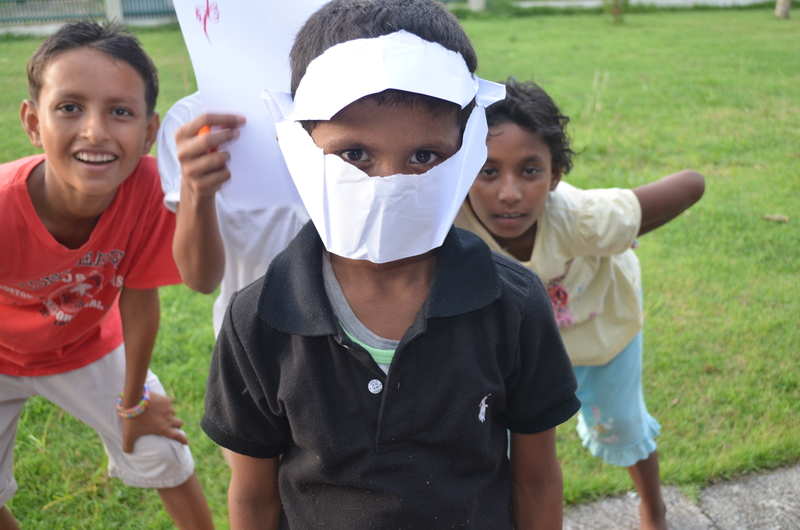 For many of these kids, a small plastic toy was the best toy they maybe ever had. At an event at a factory complex, the kids played with the cement blocks, rocks, sticks, or whatever else they could find in the dirt field. A toy means a lot to a child like that. Excited to receive an Operation Christmas Child shoebox! On Christmas morning, we woke up early, enjoyed a “white Christmas” view outside with the fog all around, then headed to a preschool owned and operated by a couple from one of the village churches. These kids live in a remote tribal village in the mountains and if they didn’t have a preschool to go to, they would be going to the rice fields with their parents and wouldn’t know any Thai when they began school. Pastor Son and his wife Wana, opened this preschool 13 years ago to serve the children in their village, giving them a safe place to play and learn Thai. We hung out with the kids and gave them each a coat. Despite being in the tropics, it gets down to 55 at night there in the mountains – quite cold when one lives in bamboo huts like these kids. It was special for the whole family to spend our Christmas morning blessing these kids in this way. The best gift given this Christmas, however, was the gift of the Gospel. Another name for Jesus is Immanuel, which means “God with us.” This name took on new meaning for me this Christmas. Being God, Jesus was all-powerful while he was on earth, but he submitted himself to the Father’s will. When he was faced with betrayal and immense suffering, he could have called angels to save him, but it would have been against God’s perfect plan. Imagine the self-control required of a martyr who could free himself at will! This was necessary, though, for him to provide us with right relationship with God. But he didn’t do it out of obligation. No! He did it because he loves each of us so deeply. Jesus desires relationship with every person on earth – the Christian, the atheist, the Buddhist, Muslim, and Animist. But because God is holy and perfect, our sin separates us from God and we cannot have right relationship with him. The Bible tells us that all have sinned and fallen short of God’s glory and the wages of our sin is death. But all along, God had a plan to save us from our sin and that plan was for Jesus to take our place so we could have right relationship with the Creator God who loves us so dearly! That is why Jesus came to earth as a baby over 2000 years ago. That is why we celebrate Christmas. THAT my friends is the best Gift anyone has ever given – the gift of salvation! Thousands of people in Thailand heard this Gospel for the first time this Christmas season, and our family was blessed to be a part of it. The Gospel is the best gift anyone can give! Thanksgiving is just around the corner, with Christmas right on its tail! It was this time about a year ago when Kyle and I began to evaluate our accumulation of stuff, began to map out floor plans and think about tiny living as a real option for us. So as we get into that season of “shop, shop, shop,” I have have a proposal for you to consider. It’s not new. I don’t take credit for it. I just want to share it with those of you who are looking for more meaning to Christmas, to the American Dream, to life. For those of you who are pursuing a tiny house lifestyle, perhaps you will be able to relate to some of these thoughts and rubs with materialism. And to all of you who read this, I hope it will shape the way you choose to send your money this Christmas season. Every Christmas, our church does this thing called Advent Conspiracy. From their website, they are “a global movement of people and churches resisting the cultural Christmas narrative of consumption by choosing a revolutionary Christmas through Worshipping Fully, Spending Less, Giving More and Loving All.” One of their invitations is to spend less money on the meaningless gifts and give more to people who really need it. Living in North America, we are some of the richest of the world. If you have traveled outside the States you may have seen this. Let’s look outside ourselves and to others this Christmas season! God has given you the resources you have so that you can meet the needs of his people next door and around the world. Check out the video below and consider what God may be inviting you to do with the money he has blessed you with this year. Kyle and I are not big gift givers, so for several years we have tried to be more conscious about the gifts we buy for family and about giving to ministries helping the lesser fortunate. We are excited to continue this habit more intentionally as we downsize our life and live on less so that we can give more. On a side note – This Christmas, we are embarking on another venture to Thailand with Kyle’s family on a program with MB Mission called “Give Christmas Away.” Instead of exchanging gifts, we are giving our Christmas away to serve the missionaries and Thai church as they host outreaches for their neighbors and tell them about the sacrificial love of Christ. We will be working alongside the same missionaries we worked with 2 years ago when we were on the TREK program with MB Mission. (You can read more about our adventures on TREK in the “Missions” page of this blog.) Kyle and I are excited to hang out with our Thai friends who became like family to us while we were there for 7 months. We’re excited to introduce them to our blood family and to serve alongside friends and family as we share the true meaning of Christmas with Thai Buddhist who have never heard. How will you choose to use your resources this Christmas? Will you consider spending less on gifts and giving more to meaningful ministries this year? Christmas doesn’t have to be stressful or break your bank. It doesn’t have to feel empty. Jesus intends for us to have full life, but the only way we find it is by giving it away! TREK is a 10 month discipleship and mission program of MB Mission, the mission sending organization of the Mennonite Brethren Conference. TREK begins with an eight-week orientation in Abbotsford, British Columbia, followed by a 7.5 month assignment. The program closes with a two-week debrief back in Abbotsford. TREK is an invitation to risk-taking obedience to Jesus, relinquishing our own rights, and learning to delight in him. We believe that mission is quite simply the outpouring of the great things God is doing in our own lives. 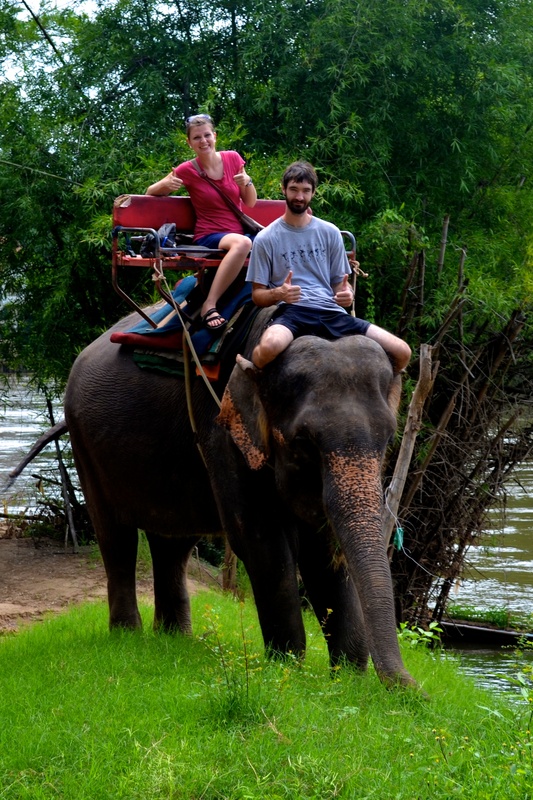 Kyle and I were team leaders of our TREK team to Chachoengsao, Thailand in 2012-2013. Read all about our adventures from our blog. To learn more about TREK and MB Mission, click here. What a year it has been for us as we have served alongside the missionaries and pastors in Chachoengsao, Thailand. Our hearts are full of praise as we look back in awe at what God did in and through us. We praise God for safety and health for us and all of our team. Although we all experienced a little sickness, nothing was critical. We praise God for His Presence in our daily lives and ministries: Hope Center youth group, Bethel Church Sunday School, and Burmese ministries. We give all glory to God for the many lives that were changed before our eyes as they surrendered to Jesus: our Coffee selling friend, Not; new and old youth Bop, Bay, Mae, Mo, Benz, Mae, Daow; Church friends P’Chin, Gai and Gao; the slum kids Oak, Waa, Ice, Gai, Fluke. We praise God for continued growth in the Church and youth group. We may have gone, but God’s Presence remained strong. Praise God! As we’ve heard bits and pieces of the ministries since we’ve been gone, we praise God for his continued work in our friends’ lives. 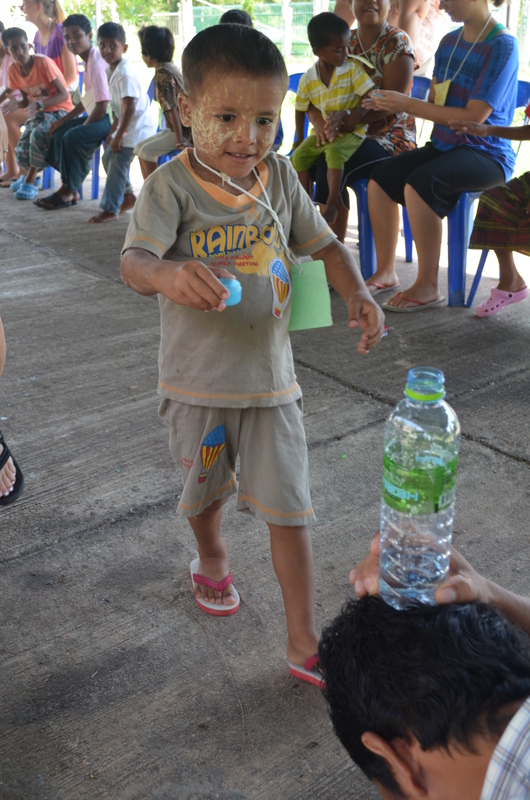 Please take time to read Dave and Louise’s newsletter about God’s continued work in Chachoengsao. https://www.smore.com/a6ze-sinclair-peters-in-thailand Finally, we praise God for renewed passion and faith in our own lives. And we are thankful that He’s not finished with us yet! Lives being changed as they accept Christ at the Hope Center. So, what’s next, you may ask. As we processed our year during debrief, we felt led towards two passions: we wanted to see people find new, vibrant life in Christ and we wanted to see our church and young people live missionally. We were approached by MB Mission staff about considering an internship with MB Mission in the Midwestern US. This would include promoting short-term programs to MB churches across the central states, assisting with coordinating the short-term mission programs in the area, and various administration duties. We agreed to the internship and I (Danae) will be joining Jon Pritchard and Joanna Chapa as a part of the Midwest MB Mission team. In the last few weeks, I have felt such confirmation that this is where we are to be for this year. I’ve found myself come alive when I talk about what God has done in and around me and when I get the opportunity to challenge friends to think about missions. We are excited to see how God uses us and broadens our passions this year. We will be moving to Hillsboro, Kansas this week, September 6. This will be an 11-month internship for Danae, and Kyle is searching for a job in the area. Since the internship is a volunteer position, we are raising a total of $9,350 to help provide for our living expenses throughout the year. We are looking for individuals who will partner with us in mobilizing young adults to short-term missions by giving one-time gifts or donating monthly. 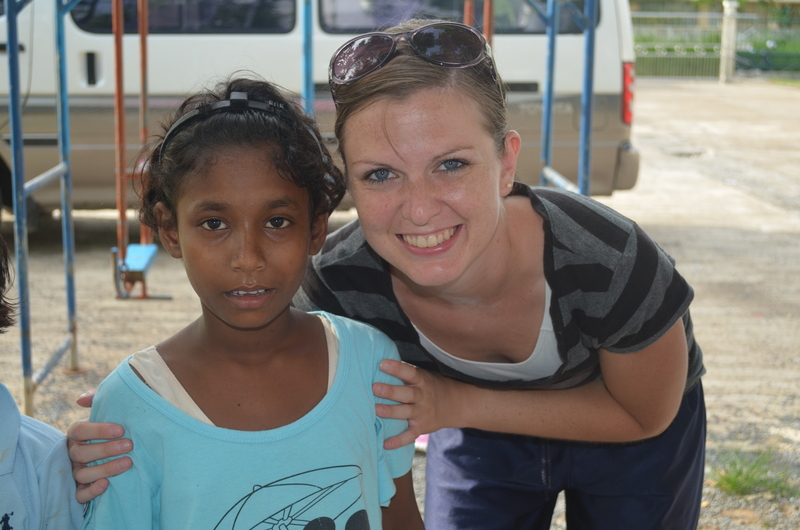 If this is something God has laid on your heart, you may donate online by going to this website https://secure.mbmission.org/donate/us/C7894 and selecting Danae’s name under “participant.” You may also mail a check to the address below. Please make the check payable to MB Mission and write “Danae Schmidt C7894” in the memo line. #300 – 32040 Downes Rd. Thank you everyone who has supported us in the last year. We saw and felt God working through your prayers, and we could not have gone without your gifts. We have been convicted of two things this year. First, missions is not a career that only the super spiritual and dedicated pursue, but a lifestyle that every Christian is called to. There are people in every neighborhood in America that do not know Jesus as their Savior. There are also millions of people worldwide that need someone to tell them about Christ. “The harvest is plentiful, but the workers are few.” We are never too old or too young for new beginnings and new callings. We served with a missionary couple in Thailand who in their 60s began pursuing long-term missions and has committed to 10 years of loving the Thai people and telling them about their Savior. We also walked beside a 77-year old short-term participant as she experienced God laying new passions and callings on her heart while in Thailand. Second, when we take risks and step out of our comfort and safety zones, we are forced to completely trust God, and we can more fully love and minister to those around us the way Christ calls us to. We have experienced that when we did what we thought was impossible to us (i.e. studying the Bible with a teenager in Thai, leading a team, loving dirty, mean kids, just surviving the Thailand hot season! ), God showed up and he proved that He is bigger than what we deem impossible. Let God do something impossible through you. Take a risk! You’ll be glad that you did. We have experienced the importance of being mentored and surrounding ourselves with life-givers. Pray that as we transition into a new community, we will be able to connect with life-giving friends and mentors, people who will encourage us and strengthen us in the Lord. We will be living with another young couple in Hillsboro. Pray for life-giving relationships to develop and that we will be able to encourage and challenge each other in our walks with the Lord. Danae will potentially be doing a lot of traveling to churches across the Midwest with the mobilization team. Pray for traveling safety as well as many open doors and open hearts to invite young people to join short-term mission programs. Pray for revival across our nation and in the Church. God is calling for prayer warriors, who will stand against the powers of darkness and hold up Christ’s Bride in prayer. Great things can happen through the power of prayer! We plan to continue our blog and email newsletters during our internship. So stay in touch! Thanks again to all of you for partnering with us! Fun at an elephant park our last week in Thailand. I feel it’s time to write an entry about our last week in Thailand. We are now in Abbotsford on debrief, and this afternoon our team shared with the group about the lives of friends we saw God transform around us. And I feel like its time for me to put into words the events that surrounded our goodbyes in Thailand. Our last Sunday at Bethel church, our team took over the service and shared some things that God taught us. We shared about people who have impacted our lives, challenged them to love each other and the unlovable around them. We showed pictures and sang songs. We had learned a Thai song about Jesus being the Living Water that nourishes our weary and broken hearts and surprised them with it. Little did we know what an impact that simple song would make on them. Kyle called on the men of the church to step up, be bold and take risks for Jesus. Monday through Wednesday, the missionaries took our team to a beautiful waterfall and we spent time encouraging one another and speaking Scripture into our lives. I’m still unpacking the significance of the words spoken to me. God is really showing me that my heart is open to hear his voice when I am in complete worship of him. What a blessing and motivation that has been for me to give him praise! Friday, we hosted our final goodbye party at the Hope Center and invited all the girls who have been coming to youth group. Of all the surprises we have seen in Thailand, God was not done surprising us. I was not expecting the emotion and affection from the new girls at youth group. A few of them made us cards, others hugged us and begged us not to go. After the tears, the girls gathered around the guitar and sung us a Thai pop song that asked us to stay. Through our frenzied planning and organizing of Friday night Hope Center youth group, God’s love was poured out on those girls. Praise Jesus! The second surprise that night was really for Judy and Irene. Their friend Jasmine and her mother and sister came to the goodbye party. Jasmine’s family has forbidden her from interacting with Christians, but due to the family’s German heritage, Judy and Irene have been able to develop a relationship with the family. They, especially the sister, have been very closed to the gospel, but Friday night, she began to ask Judy questions about prayer, and Judy and Irene were able to pray over them before they left. Jasmine’s mom rekindled her relationship with Ajaan Naat and we are encouraged to see the door that was previously tightly closed, crack open a bit. Even Dave and Louise’s neighbors, who have been very closed, cold and hard for years, showed up. Conversation and new relationship between Louise and her neighbors began that night. Praise God that he can melt even the hardest of hearts! Our last night, we went out to eat with the missionaries, pastor, Not and Goi and three of the youth. Afterwards, our team prayed over and encouraged Not and Goi with Scripture. Not said that we have planed so many seeds this year – one of them being him – and one day they will grow into huge trees that will bear much fruit. Amen! Some seeds have not sprouted yet. I think of my friend Cindi whom I got the chance to share the gospel with and challenge to read the Bible. Although she says she believes in God, she also believes in Buddha and sees no reason to change. Others are seedlings and are very fragile, like Oak and his siblings, who for possibly the first time in their lives, have experienced the love of God through us and the church. Some seeds are flourishing and beginning to grow fruit, like Not, who can’t keep quiet about the goodness of God, and who will soon be moving his coffee shop to Hope Center, where he can draw in and minister to youth. What a blessing it has been to be a part of the planting, watering and harvesting of the Kingdom of God in Chachoengsao, Thailand! 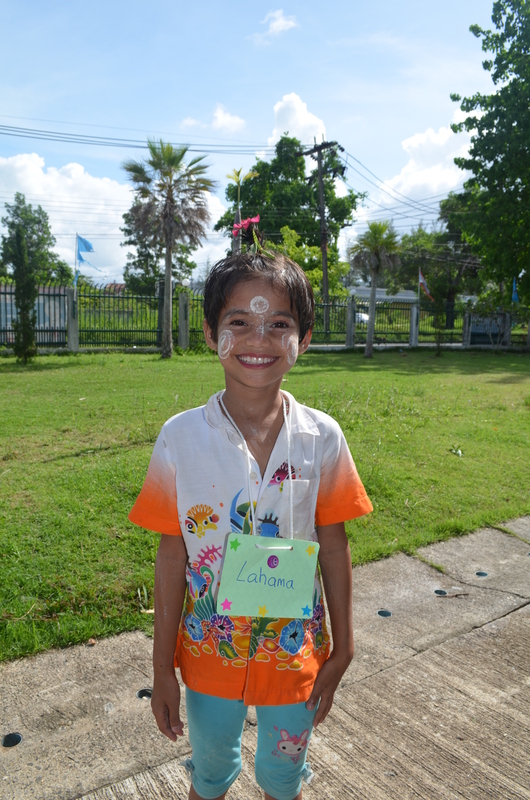 I pray that God will one day soon lead Kyle and I back to Chachoengsao. We are leaving a new family. This place has become like home to me and I’m sad to leave. So as I sit here in another world only a week later, praising God for the wonders he has shown me and morning the loss of dear friends, I am comforted by Philippians 1:6, “I am confident of this, that he who began a good work in you will carry it on to completion until the day of Christ Jesus.” I pray with confidence that God will send workers into the field I left behind. That he will plant more seeds in the lives of those who don’t believe, water the seed that just barely cracked open, protect the seed that is barely spouting and so vulnerable to evil that could rip it up, and encourage the trees that are beginning to bloom and plant seeds of their own. Prajaow oi pon (God bless you), my Thai family. These are my prayers over you. You’re the Lord of this nation. You’re the Peace to the restless. 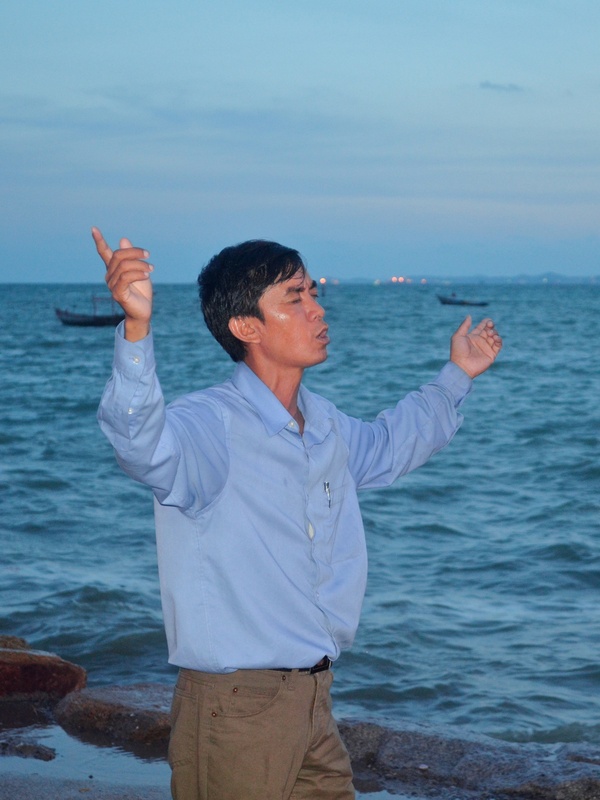 Praise God that the Kingdom of God is growing among the Burmese in Thailand! 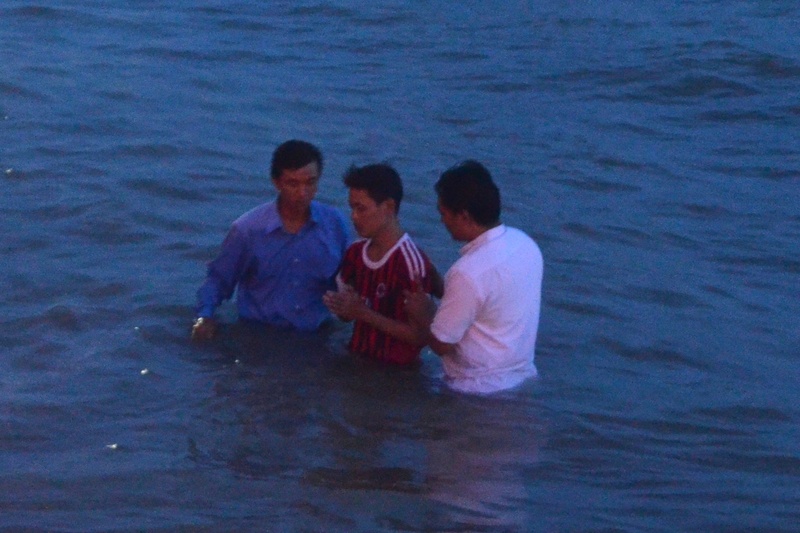 Last Sunday, 12 new believers from the three Burmese church plants chose to declare their faith and be baptized. It was a big party as we filled two songtaos, and three pickup trucks with people and brought them to Bang Saen Beach just south of Chachoengsao. Almost 70 people joined us for the celebration, many of them seekers or young believers. 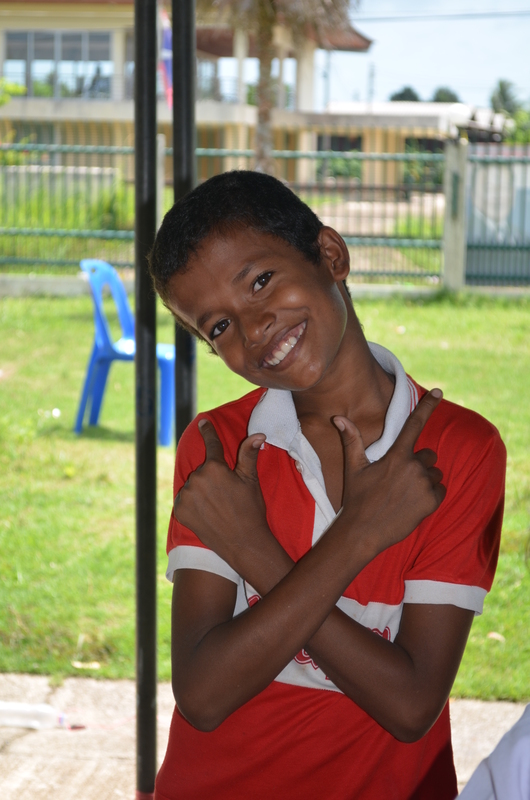 Burmese people work very hard in factories and rarely get opportunities to have fun. It was a joy to watch them play in the ocean waves and laugh together. 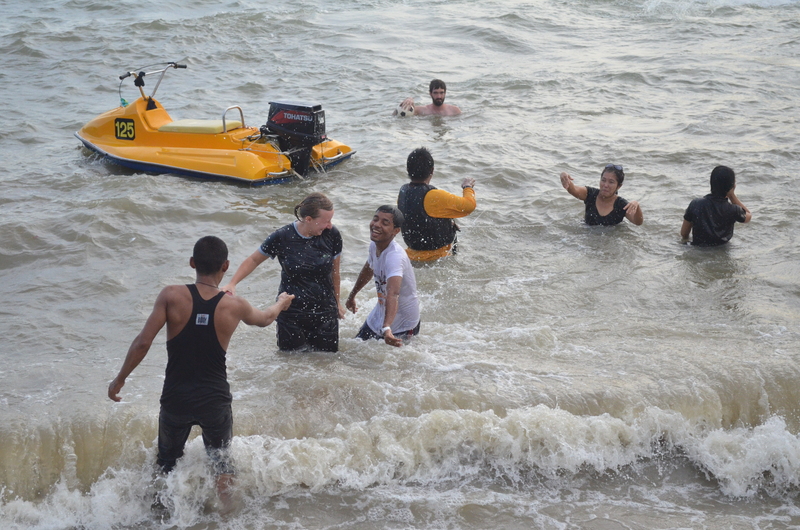 Several of them went on inner tube rides for the first time and others did flips over the waves as they came ashore. All were laughing and thoroughly enjoying themselves. Members from each of the church plants brought food, drinks, and snacks to share with the crowd. After the play, we gathered together to worship our Creator. 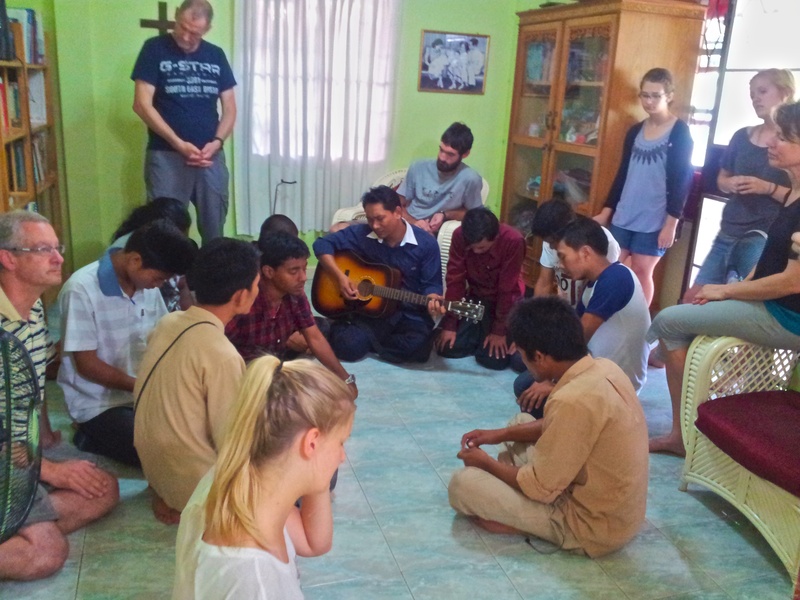 What a beautiful testimony it was to onlookers as Burmese and Farang (foreigner) believers sang together. During worship, Ajaan Mo-aow was filled with the spirit as he interceded reverently for the church. He told us later, he received a word from God that there were many more lost sheep he was to gather into the Kingdom. 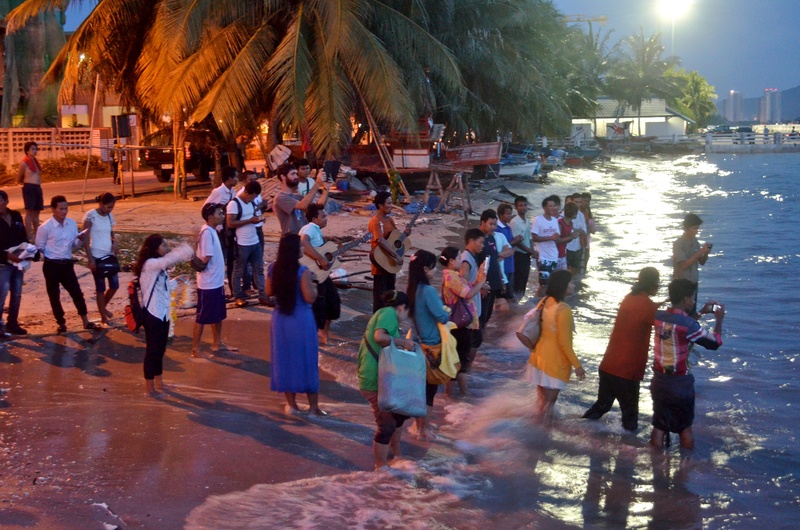 The evening continued with a joyful baptism in the ocean, more songs of praise, a word from the Lord preached in English, and translated to Thai, then to Burmese. It was awesome to see the joy on the leaders’ faces as they celebrated the expansion of the Kingdom. Ajaan Isaiah is the lead pastor at Lighthouse church, but he depends on other leaders and interns for mentoring and discipling new believers at Lighthouse, Bo Thong, and Bang Sai where the other church plants are located. He told them what a blessing it was to see them step out in faith and disciple these 12 people and prepare them for baptism. Though they face many obsticles along the way, they faithfully tell others about Christ and minister to their communities. One of the interns, Mochit, said that Sunday afternoon before the baptism, there was a lot of confusion at his church plant in Bang Sai about transportation to the beach, and many of the members of the church decided not to go. Although he was discouraged, he went to their homes to convince them to come and in the end they all came. This church has grown from 2 to 15 in the 7 months we have been in Thailand. Praise God! The Burmese know how to have fun! The 12 baptismal candidates from Bang Sai, Bo Thong and Lighthouse church. Standing on either end is Ajaan Isaiah and Ajaan Mo-aow. Celebrating new life in Christ! Praying for the leaders of the local Burmese churches. God continues to surprise us here in Thailand, even in our last month of ministry. 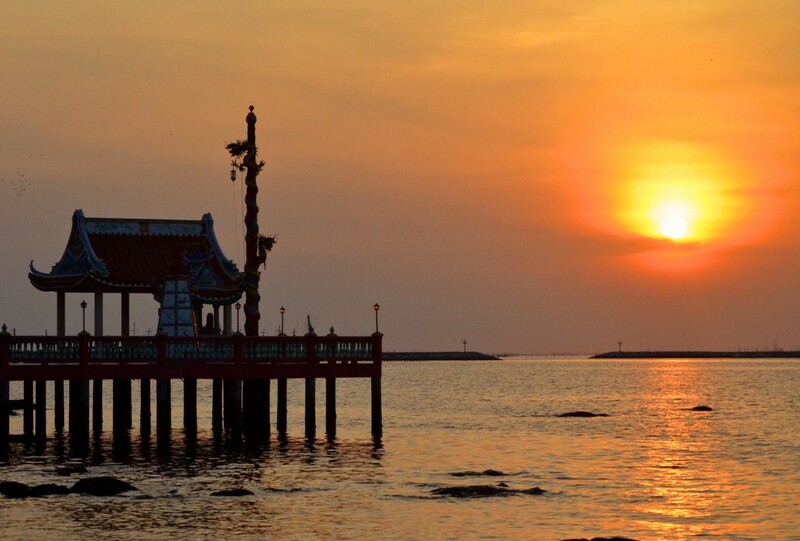 We had a second opportunity to go to Phuket recently and God moved powerfully in our midst. Here’s an excerpt with a little more detail from our latest Newsletter. We had the wonderful privilege of serving and loving on some of the most beautiful children this month. 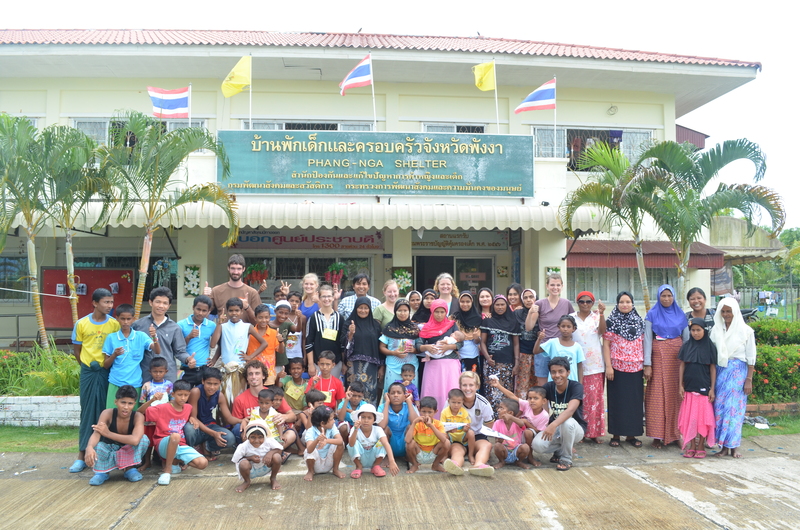 A team of 8 farangs (foreigners), two Thai, and two Burmese Christians went to a refugee shelter in PangNga province of southern Thailand and held a 4-day kids club/English camp for the 60 Rohingya children there. The Rohingyans are a predominately Muslim tribal group from a western province in Myanmar (Burma), who have been undergoing persecution by the Myanmar government for 30-40 years. In 1982, a law was passed in Myanmar denying them citizenship, which over the last several decades has resulted in harassment, violence, imprisonment, and eventually mass exodus of hundreds of thousands Rohingyans. This last week, a law was passed prohibiting only Rohingyans from having more than two children. The UN has described them as the most persecuted people group in the world. Many of them, including the ones at the shelter where we worked, were driven from their homes after the government burned their village. 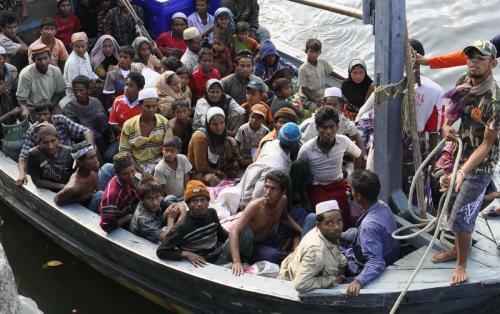 They left Burma in three long-tail boats, with about 100 people in each. On their journey, they ran out of food, water, and gasoline for their engine. When they finally arrived in Thailand, the men were sent to detention centers where up to 40 of them are being held in a small room, and the women and children are being detained at women’s shelters across Phuket island until the Thai government decides what to do with them. The group from this camp fled Burma on a boat similar to this one. This baby was born on the boats fleeing from Burma. As we interacted with the children, their stories began to surface. Some of the children were just swimming and playing around the boats when they set sail from Burma and in the mass confusion, they were brought aboard and taken with the refugees. A 12-year-old boy told us he has no mother, father, siblings or friends here at the shelter. He was all alone. Akikstan, around 9 years old, is also alone. His parents were left in Burma, and are most likely dead. There is a rumor that the Thai government will send them back to Burma, and a teenage boy said he would rather die than go back to his home country. One of the women told us the violence was already happening when she was a child. Her home has been burned many times and she experienced many violent acts as a child and young woman. Mohammad Ismiel, about 12, drew a detailed picture of a boat with a Muslim flag, and two dead people in the boat. Most, if not all, of these children have seen war, death, and destruction, and have experienced much trauma, which was evident in the way they fought or in their suspicion of us. Akikstan is very bright and always smiling. Lamong and other boys his age made many of these paper army masks and guns. Our mission in coming to this camp was to love on the children and mothers, and to tell them about the love of Jesus Christ. 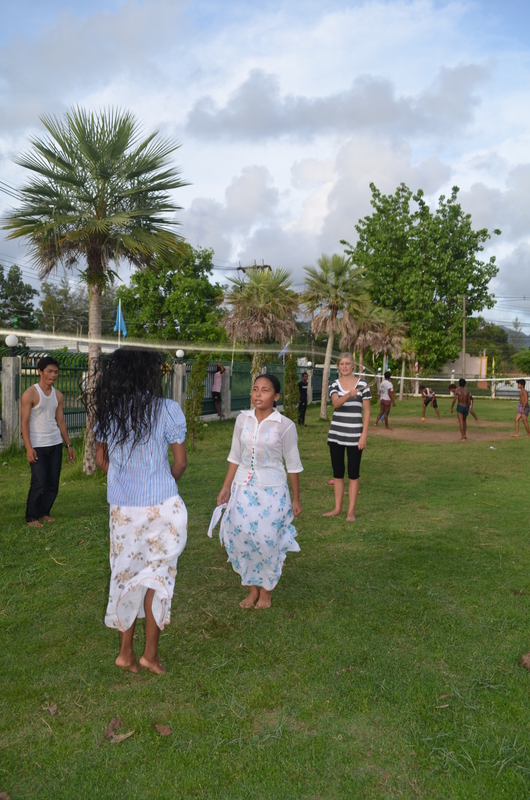 We played group games, sports, jump rope, had crafts or coloring available, taught basic English, and had a story and singing time. One of the women at the camp translated the Bible story from Burmese to their native tongue, but most of our communication was through the kids’ very small Thai vocabulary, hand motions, pictures and examples. Through this experience, God taught me two things: how to trust and how to love. Going into the week, we were nervous about how we were going to lovingly share the Gospel message with this group of Muslims who had been kicked out of their country due to religious and ethnic persecution. But faithfully, we prepared stories about God’s love for people, Jesus’ miracles and for the last day, his death and resurrection. The first three days brought discouragement when it came to the story time. The Rohingya woman who translated appeared wary of us and like she didn’t want to translate the story she was hearing. Most of the women stood to the side watching with very little interaction during the activities. They enjoyed playing ABC Bingo, but ran away as soon as we brought out colored string to make friendship bracelets. Buddhists often wear strings around their wrists to protect them from the spirits and we wonder if they were associating our bracelets with this Buddhist tradition. During this discouragement, God reminded me of the verse in Romans 1 that says, “I am not ashamed of the Gospel of Christ, for it is the power of God for the salvation of everyone who believes.” He told me it was HIM who brings salvation, not me. Therefore, there should be no shame in declaring Him to unbelievers. That day, God began to move in the translator’s heart. We were able to speak directly with her and ask about her story. She thanked us for coming and said for once, they have been able to forget their hopelessness and have fun. We asked if we could pray for them as a group the next day before we left and she willingly agreed. The next day, her response to our presence was very different. She was present the entire morning, laughing and playing right along with us and the kids. She was ready to translate the story of Jesus’ sacrifice for us on the cross and appeared fully engaged. After the activities, we gathered everyone together and stood in a big circle while we prayed out loud for them and their people. Afterwards, as we said goodbye to our new friends, the women who had seemed hard and suspicious all week long, clung to us sobbing. Several of them asked us through hand motions if we could take them home with us. How we wished we could! Teenage boys buried their faces in their hands. The young kids looked scared that something terrible was happening. One boy burst into tears as we drove away. This is the woman who translated from Burmese to Rohingyan. God’s heart poured out through ours. It was a moving time, where God showed me a piece of his heart. 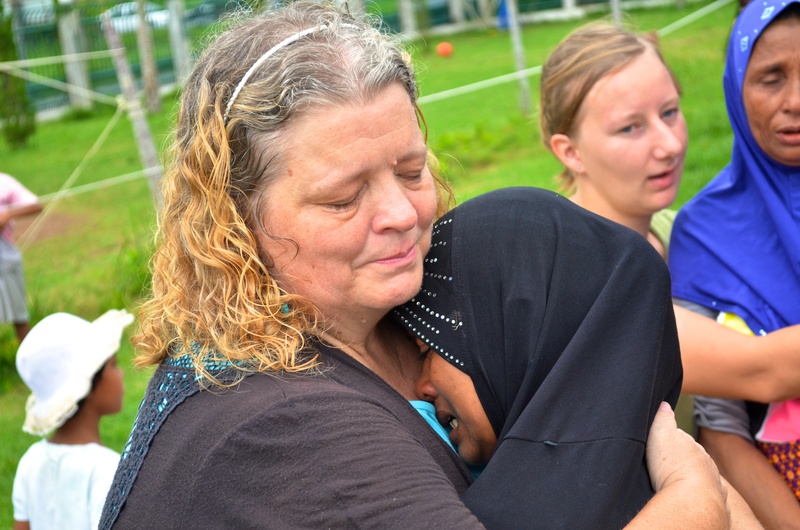 It was my prayer from the beginning that Christ’s love would pour through me into those kids. From their response at the end of the week, we know that the women and children experienced the love of God through us. And I have never been so overwhelmed by emotion, so heartbroken for the children and women as we drove away. I think that must be a glimpse of what God feels every time a child is orphaned, a mother is widowed, or a family driven from their home. If I was filled with love so much for these people I barely knew, how much more does God love them and weep for them! Passages like Psalm 146:7-9 have new meaning to us now, and we are encouraged that it is the Lord “who upholds the cause of the oppressed, who gives food to the hungry. The Lord sets the prisoners free, gives sight to the blind, lifts up those who are bowed down… The Lord watches over the foreigner, he sustains the widow and the fatherless.” That is my prayer for the Royhingya refugees. 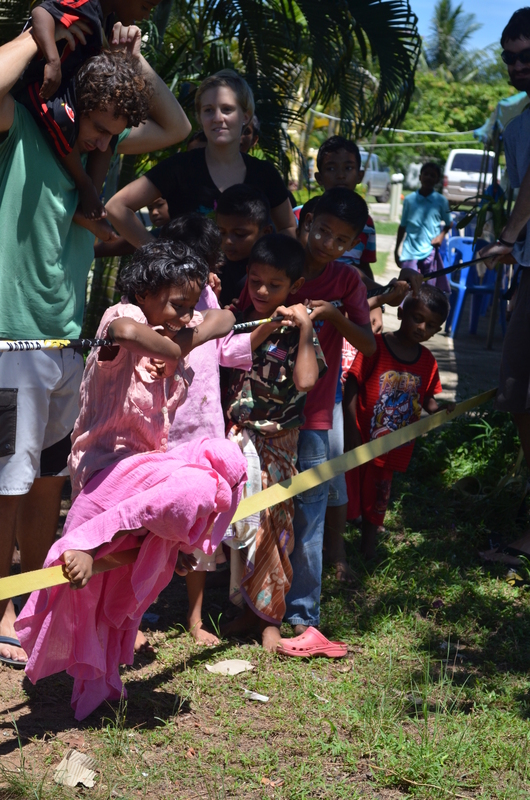 Even the young women enjoyed jumprope. Tscakamod rarely smiled unless he was captivated by the fun of the game.